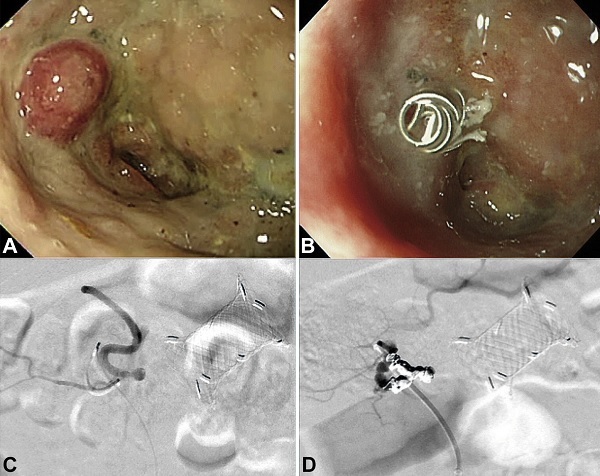 Our video case describes a pulsating pseudoaneurysm in the cavity of a walled-off necrosis (WON) diagnosed by endoscopy through a fully-covered biflanged metal stent (BFMS). Subsequently, the pseudoaneurysm was successfully treated. A 38-year-old man developed an infected WON after severe necrotizing pancreatitis. A novel BFMS (16 mm in diameter and 20 mm in length) was placed under EUS guidance. 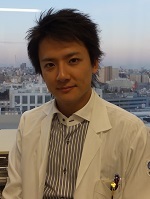 Then, direct endoscopic necrosectomy (DEN) was performed through the BFMS. Seven days after DEN, he vomited blood; we suspected bleeding from the cavity. Emergency angiography was not able to detect any obvious bleeding point. After seven days of conservative therapy, an endoscope was advanced to examine the condition within the cavity. Surprisingly, a pulsating pseudoaneurysm was found. Subsequently, the pseudoaneurysm was treated by coil embolization. Interestingly, a “second-look” endoscopy determined that the pseudoaneurysm completely resolved after use of the embolization coil. Figure 1. Endoscopic imaging revealed a pulsating pseudoaneurysm (A). A “second-look” endoscopy demonstrated that the pseudoaneurysm completely resolved after use of the embolization coil (B). Angiography revealed a pseudoaneurysm (C), which was subsequently treated by coil embolization (D). To the best of our knowledge, this is the first video which shows a pulsating pseudoaneurysm detected by direct endoscopic imaging and subsequently successfully treated by coil embolization. Bleeding from the cavity due to the rupture of a pseudoaneurysm is a fatal complication in patients with WON. Thus, the management of bleeding is mandatory for treatment success. BFMS is useful for the treatment of WON also in that observation in the cavity of WON by endoscopy can be easily performed during the treatment course.